For a kid, nothing is more fun than playing outside. And when play is involved, Nature is the perfect tool to help kids understand not just the wider world, but themselves as well. Other than just the usual parks and outdoor playgrounds, there are plenty of options when it comes exposing the kiddos to Nature - with Boardwalks being one of them. The greatest draw of bundling the entire family to explore a Boardwalk has got to be its price - IT IS FREE! But what actually makes a Boardwalk outing so enticing is the boardwalks are all relatively easy for the little ones to conquer. In fact, most of them are so kid-friendly that skate scooters and strollers are welcome! Here are the 10 most family-friendly boardwalks in Singapore to bring your family to. This boardwalk hugs the scenic Changi coastline from Changi Beach Club to Changi Sailing Club. The boardwalk is made up of six segments: Sunset Walk for a splendid view of the sunset, flanked by a hill of lush greenery on one side and the sea on the other. 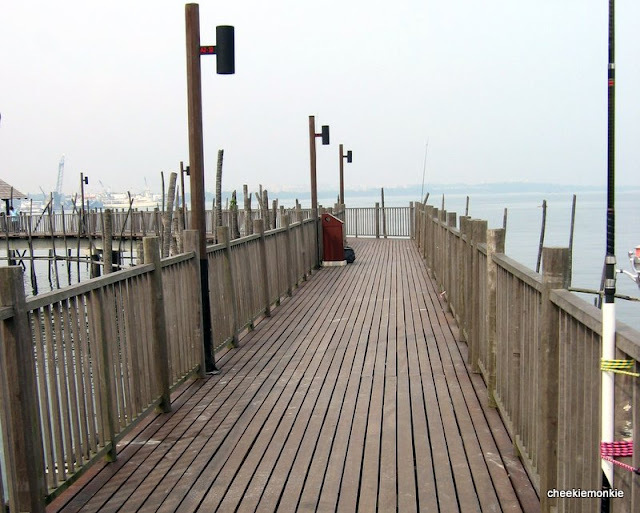 Kelong Walk: a stretch of the boardwalk with kelong stilts built over water. Cliff Walk: built slightly inland, this part is a path through lush greenery. Viewing decks along this stretch at vantage points provide panoramic views. Sailing Point Walk: the longest stretch of the boardwalk, and provides open views of the sea. Beach Walk: second longest stretch of the boardwalk and faces the Serangoon Harbour and Changi Beach. 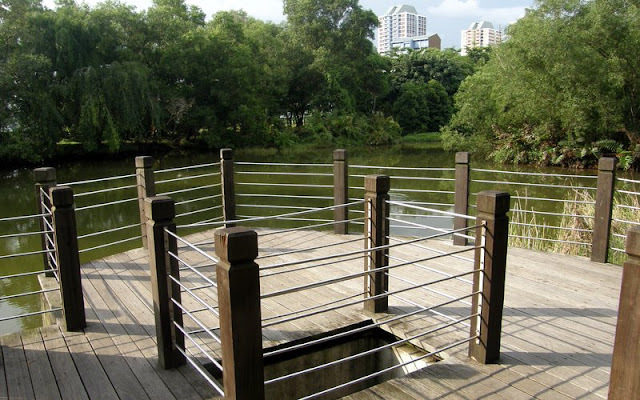 Creek Walk: this portion lies on the southern bank of Sungei Changi. With marine life and birds being sure visitors here, the best time to visit is in the late afternoon to catch the sunset. The boardwalk totals 1.2 km and is extremely easy for children. Continuing the walk from Changi Beach Club to Changi Village covers a total of 2.6 km and forms the Changi Point Coastal Walk. A bumboat ride takes you to Pulau Ubin, home to Chek Jawa, a stretch of intertidal flats on the island. The beauty of Chek Jawa is that several different ecosystems can be seen in one small area. Here, 1.1km of boardwalks lead you to the mangroves where families get the chance to get close to fiddler crabs and mudskippers as well as the marvellous Nipah palms. At low tide, take a closer look at some of the strange animals that live among the rocky shore, including barnacles, crabs and fierce shell-drilling snails. In fact, there are so many species that dwell in Chek Jawa that each return visit is likely to stumble onto new discoveries! The landscape, too, is constantly changing with the tide. Address: At Ubin Jetty, you can hire a van to take you to Chek Jawa, which usually costs $3 per person for one-way. The van will drop you off at Punai Hut and you will have to walk the rest of the way to the Chek Jawa Information Kiosk and entrance to the boardwalk. Located within walking distance of Labrador Park MRT Station, the 2.1km Labrador Nature & Coastal Walk comprises three distinct segments – Alexandra Garden Trail, Berlayer Creek mangrove trail, and Bukit Chermin Boardwalk. Crucial to Singapore’s biodiversity, back mangrove species can be found at the Berlayer Creek boardwalk, while coastal cliff vegetation can be found in the nature reserve. Possibly the only mangrove patch in the southern part of Singapore island with the convenience of an integrated MRT station entrance, you are immediately greeted by the lush landscape of the entrance plaza before you enter the 960m Berlayer Creek. Currently one of two remaining mangroves in the south of mainland Singapore, Berlayer Creek is home to a myriad of fauna and flora, including one of the highest densities of molluscs in Singapore. For kids, the 330m Bukit Chermin Boardwalk that comes after Berlayer Creek will be the highlight. This elevated boardwalk on sea brings them across the mouth of Berlayer Creek and along the coastal foothill of Bukit Chermin. Take a leisurely stroll along this coastal boardwalk, while enjoying the different views of the expansive waters of Keppel Harbour, the lush greenery of Bukit Chermin hill, and the distant rocky cliffs of Sentosa island. During high tide, the low-lying boardwalk will bring you close to the water surface where schools of fishes can be sighted; while at low tide, you can also spot seagrass beds and different species of crustaceans found on the extensive mudflat. 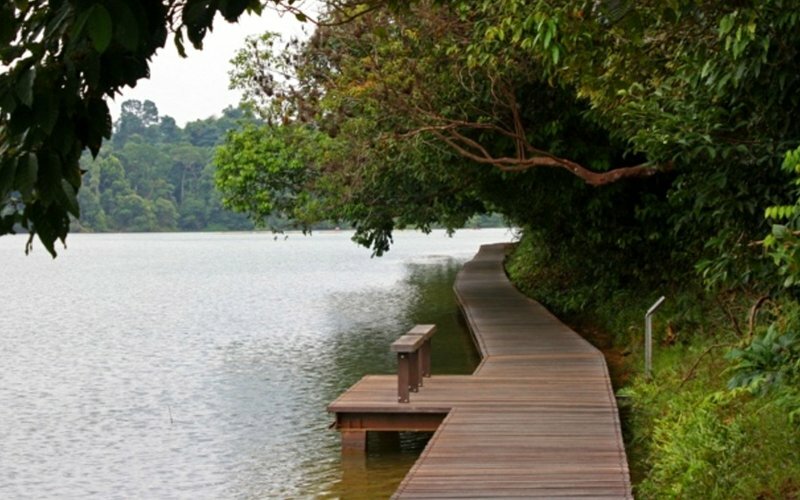 This 900m boardwalk through the Central Nature Reserve brings you through one of Singapore's last remaining mature secondary forests and along the edge of Lower Peirce Reservoir. This is a relatively simple 45-minute walk, suitable for families with young children and the elderly. Shaded by the forest, the walk is pleasantly cool with lots of informative signboards along the boardwalk that tell visitors more about the flora and fauna of this forest. The forest is home to more than 900 flowering plants, 100 ferns and 250 animal species. Families will encounter a wide range of wildlife from mammals to aquatic creatures and be rewarded with a peaceful walk by the water’s edge towards the latter half of the boardwalk. Address: Lower Peirce Reservoir. Start your walk near house no. 72 along Old Upper Thomson Road at the Casuarina Entrance. 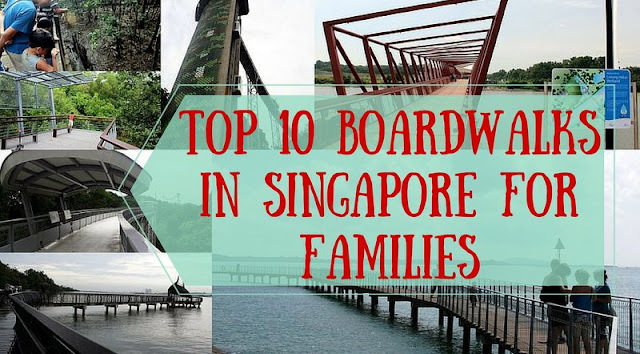 There are two boardwalks at MacRitchie that you can explore with the kids, with each taking approximately one hour. The first is the 1.5 km Chemperai Trail which starts at the western end of the reservoir, left from the car park. It is an easy and relaxing walk as it is mostly on boardwalk from start to finish, skirting the edge of the reservoir – which makes it extremely suitable for families with young children. The trail allows for the easy spotting of thriving dragonfly and damselfly communities, as well as a close encounter with interesting trees and plants along the boardwalk. The second trail, Prunus Trail, starts near the entrance of MacRitchie Nature Trail from MacRitchie Reservoir Park. It is the shorter boardwalk, part of Prunus-Petai Trail and is a relatively easy trail. Aside from the intriguing plants and trees, keep a lookout for native creatures of the forest. Tread softly, talk quietly and you might be rewarded with sights of the Common Sun Skink, Clouded Monitor Lizard and Oriental Whip Snake basking in the sun, Plantain and Slender squirrels leaping gracefully from tree to tree, a cheeky Long-tailed Macaque or two. At the end of the Prunus Trail, you will arrive at the junction of Petai Trail and MacRitchie Nature Trail. Opt to continue on the boardwalk via Petai Trail, a relatively quiet trail, you will be able to see more wildlife and the occasional glimpses of native birds. We all know about the giant spiderweb-like structure and other playground amenities that Pasir Ris Park has to offer. But how about a Mangrove Boardwalk? And the good thing about this hidden gem is that it is suitable for people of all ages - even stroller-friendly! This is a definite thrill for families who are up for some crab or mudskipper-spotting. Along the way, get ready to spot peculiar 'humps' in the ground made by mud lobsters, as well as the scampering tree-climbing crabs. Do make sure you walk until the end of the Boardwalk too for it holds yet another gem — a jetty overlooking Sungei Tampines. It is here where kids can try to spot different forms of wildlife; ranging from herons, kingfishers, water monitor-lizards, gliding lizards (otherwise known as 'flying dragons'), fishes like halfbeaks and archer fishes, and even dog-faced water snakes. Address: Pasir Ris Park stretches from Pasir Ris Road to Jalan Loyang Besar and can be accessed through Elias Road and Pasir Ris Green. To access the Mangrove Boardwalk, park at Carpark C.
The lookout points along Punggol Promenade Riverside Walk allow visitors to get closer to the adjacent Serangoon Reservoir. 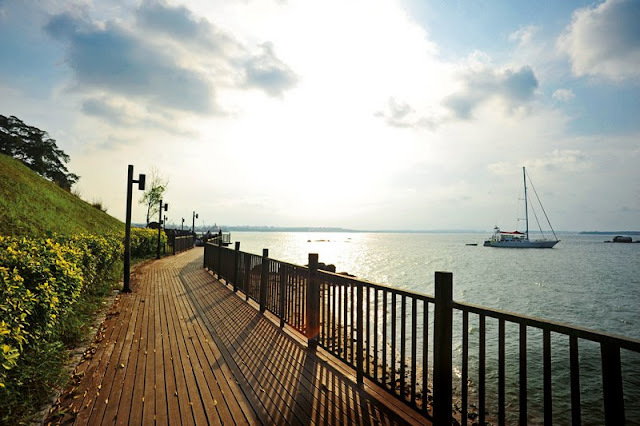 Linking Punggol Point to Punggol East, Punggol Promenade consists of three thematic zones – Riverside Walk, Nature Walk and Punggol Point Walk. Each segment is unique and offers a variety of recreational experiences. To seek out the area’s abundant flora and fauna, take a stroll on the Punggol Promenade Nature Walk – the middle section of Punggol Promenade – where the meandering trail is dotted with fishing platforms and rest shelters. Come nightfall, distinctive design features that make use of fibre optics light up the reservoir edge. From Punggol Promenade Riverside Walk, you will not be able to miss the red and elegant Lorong Halus Bridge. Resembling an old, steel railway bridge, it greets visitors entering the Lorong Halus Wetland, a former landfill transformed into a wetland spanning an area of 18 football fields. Kids will be able to dance among the tall cattails growing throughout the wetland and learn how the wetland collects and treats rainwater passing through this former dumping ground, before it reaches the adjacent reservoir. Address: Enter from the cluster of food and beverage outlets at Tebing Lane, located adjacent to the riverside walk. Make your way through the mangrove forest boardwalks, or watch the birdlife over the freshwater wetlands – especially during the September to March migratory season. Boardwalks keep visitors safe – and their feet dry – as they venture deep into the mangroves to catch sight of tree climbing crabs scuttling up trunks of trees, mudskippers skimming across swamp waters and archerfish shooting insects with jets of water. The NEW Sungei Buloh Wetland Reserve extension is more kids-friendly, with three different boardwalks catering to all nature enthusiasts. The Mid-canopy Walk immerses visitors in the understory of a secondary forest through an elevated, 120m-long boardwalk, where they can spot birds and insects like cicadas that reside in the mid-canopy region and forest floor while the Coastal boardwalk offers a scenic and breathtaking view of the Kranji waterfront with a lookout point where raptors such as the Ospreys and White-Bellied Sea Eagles can be spotted hunting for prey. At low tide, visitors can even observe crabs and fish foraging for food in the waters. 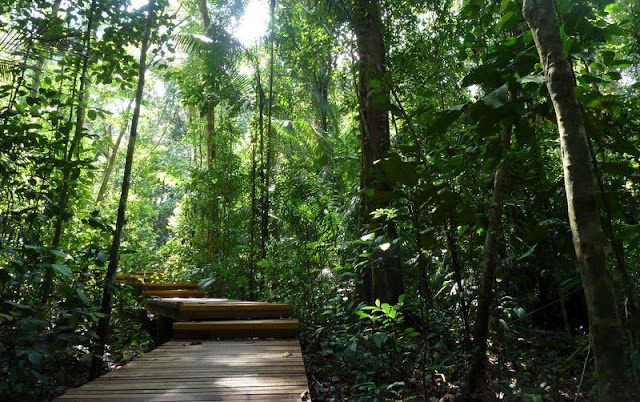 Lastly, the Forest Trail offers visitors the chance to experience the sights and sounds of the reserve up close, and learn more about the plants and wildlife which are unique to the reserve. Although more famous for its Adventure Playground and sprawling lawns, West Coast Park hides a tiny gem on its eastern end. Take a slow and easy walk to Marsh Garden and be amazed at its thriving biodiversity. A short boardwalk brings you into this little corner filled with fishes and ringed by trees. The Marsh Garden might seem quiet at first sight but it is teeming with activity and interesting creatures. If you go there early in the morning, you might just get lucky and spot some Cockatoos, and even some monitor lizards in the marsh! The newest of all boardwalks, this walk is probably one of the easiest for kids - and most scenic too! An 11-storey elevated bridge which leads visitors on a trail above the canopy treetops en route to Fort Siloso, the Skywalk has panels along the trek which offer information on the fort’s history and the surrounding areas. The route is straight-forward and takes less than 10 minutes from end to end and at the end of the walk, everyone can enjoy Fort Siloso, which has also opened its grounds for all to explore FREE of charge. Thanks for this info! So important for our kids ( and ourselves too) to get out to experience the wondes of nature. Keep it coming! Am I right to say we can still access to the boardwalk through stair after 7pm ? Sorry that i missed out on replying on your comment. Yes, I should think so but I think it's better to check with Sentosa before heading down after 7pm.